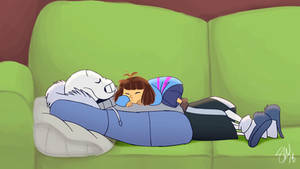 If anyone here watches Glitchtale they might recognize this scene, I often heard or saw pics about it and I finally got curious and checked one episode, and that particular scene with the music gave me chills won't spoil what's going on but I couldn't resist animating something based on this part. Worked on it on and off for about a month. Me - I will never animate skeleton hands ever again. Also me - Let's make yet another animation with skeleton hands. Oh this reminds me of the bit where Sans is possessed by Betty! The face he makes is chilling, and if that’s what you were going for, you mimicked it perfectly. This looks so cool! I'm interested in learning to animate. I'm not a part of the undertale fandom, but this is awesome! OMG SO I JUST FINSHED HAVING MY SEZUIRE AND SO NOW WHAT APP DID U USE FOR THIS BEUTIFUL MATAHPIECEEEEEEEEEEEE!!!!!??????? This is woooow! Ok time to scroll through all your gallery! These animations are very well made. Keep it up. You happened to watch the episode with the highest quality animation lol. oKAY teach me your skills cause holy balls this looks AMAZING. thanks for the suggestion. totally gonna check it out! Looks like the face you make when you're about to put a good friend out of their misery. did he just rised the sun? I love how the eye only changes when his hand goes over it; that's a very interesting concept. Glad you noticed that :') Thanks! I have a question: which variant did you choose for the program TVPaint? School, study or something else?! The series based on "Undertale"